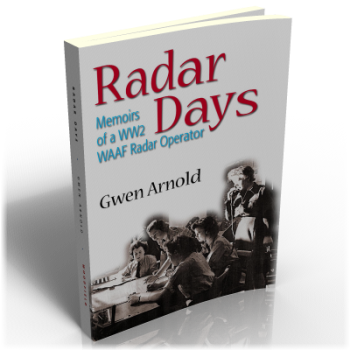 Gwen Arnold takes her readers on an entertaining journey from her formative years in the seaside town of Bournemouth to her wartime role at Bawdsey Manor RDF Station near Felixtowe in Suffolk, where she was stationed for most of the war. On the way there are humorous and well-observed vignettes of her family life, her first experiences of employment in her home town, her early romantic liaisons and her induction into the armed forces... all of which combine into an evocative snapshot of the period. In common with many young women of her generation, Gwen's search for a suitable young man with whom to spend the rest of her days was played out against a background of bombs, blackouts, curfews and 48-hour passes, with snatched moments of relaxation and romance amongst long weeks and months spent ‘doing her bit for the war effort’ – which in her case involved working with early versions of the Radio Direction Finding (RDF) equipment that would later become known as ‘Radar’, monitoring the movements of Allied and enemy aircraft and shipping in the North Sea.